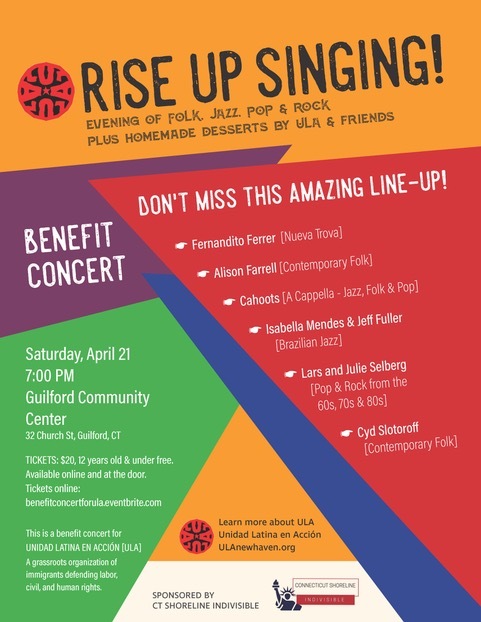 Rise Up Singing is an evening of Folk, Jazz, Pop and Rock. It takes place on Saturday, April 21, 7:00 pm, at the Guilford Community Center, 32 Church St., Guilford CT. This is a benefit concert for Unidad Latina en Accion, a grassroots organization effecting positive change for immigrant rights in greater New Haven, CT. Working with other community organizations, ULA brings safety, fair treatment, and justice for immigrants. Tickets are available at: benefitconcertforula@eventbrite.com and at the door. $20 for adults, 12 years old and under are free.